Unless you are a devoted blogger – which it appears I am not — it seems to be that there are periods of time when you are so busy planning, doing, and figuring things out that blogging doesn’t really make it on to the to-do list. Its not that other people don’t use their blogs to reflect, plan, and report on small (and large) fears and joys as they experience them–on the contrary–it just seems that I’m not that kind of blogger. And, as a result, this blog starts to sit dormant and looking like it might have gone dark. Its not that I don’t like reading other people’s experiences of bad hair days, flat tires, and unexpected joys as they unfold in their lives. Just the opposite. Some of the best blogs I follow share the intimate details of these events and make really good reading as a result. Its just that I prefer to go away and plan, reflect and feel the fear of whatever it is that’s happening to me, and not post it on the wall for all the world 15 people to see. I don’t feel the need to write it all down in private either, I guess I just work through it differently. This is all a preamble to fact that I am kind of overwhelmed – in a good way — right now with the events of the next six months or so, and trying to make them unfold in an order that pleases me. A recipe for disappointment, perhaps, but we have to at least have a stab at making us feel that we are masters of our own universe, right? So the blog has been silent for a while as I am embroiled in a considerable amount of event planning that includes college tours for the summer, major surgery, new job opportunities, visits from family, trips to exciting new places, summer school placement and our annual trip to Greece. Mixed in with all the daily responsibilities, IB demands, and work schedules, it makes me wonder how I ever worked full time. Except that not too long ago I did. And managed to sell our house and move our lives halfway around the world at the same time. Its all doable, I guess, I am just less exhausted and overwhelmed by everything: busy getting through the pile, just not on an never-ending hamster wheel of demands. That’s as near to balance in my life as I can imagine. So, in my attempt to not totally wimp-out on January altogether, I think I just wrote a reflective post about being a non-reflective blogger! Who knew?! ← I’m Dreaming of a White (Beach) Christmas…. So glad to read your post! (Proud of you!) I sat down at my computer this morning to write two posts, but decided to read yours instead ;-). And, um, I think I recognize the lake in the picture, but I can’t remember its name. Was that Day 2 of C2C? Of course you recognized it! Probably the only person that would! 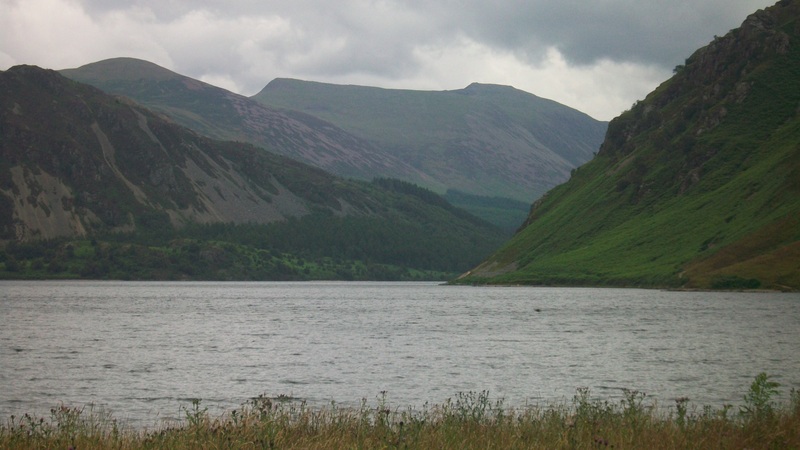 Yes, its Ennerdale Water, where we stopped to have a picnic.